Images may be recorded at any point after ingestion. Capsule endoscopy is superior to radiographic techniques in the detection of mucosal disease and angiodysplasia. Investigators have capitalized on the advantages of this approach, revealing an expanding list of clinical indications. VCE has primarily been used as a diagnostic tool for detecting obscure GI bleeding,  but it has also aided in the diagnosis of inflammatory bowel disease (IBD) and celiac disease and helped in the detection of small-bowel neoplasia. GI bleeding is obscure when it continues or recurs after upper and lower endoscopic examinations have found no source. Most obscure GI bleeding is due to lesions in the small intestine, a region that has traditionally been difficult to image adequately. Before VCE, the standard procedure comprised a combination of diagnostic methods, including upper endoscopy, colonoscopy, and push enteroscopy, as well as enteroclysis, nuclear bleeding scans, angiography, and small-bowel follow-through studies. Capsule endoscopy has been favorably compared with push endoscopy in patients with obscure GI bleeding. [16, 17, 18, 19] Leighton et al demonstrated the superior diagnostic yield of capsule enteroscopy for obscure GI bleeding as compared with that of push enteroscopy plus small-bowel follow-through study. In this study, capsule endoscopy was found to be more sensitive, in that enteroscopy detected no cases that capsule endoscopy had missed. Whereas push endoscopy, for example, offers the capacity for biopsy and treatment (eg, argon plasma coagulation for angiodysplasia), capsule endoscopy does not allow immediate intervention. However, capsule endoscopy may be used to plan subsequent interventions. In a study of outcomes in 33 patients observed for up to 20 months after undergoing capsule endoscopy for obscure GI bleeding, Maldonado et al found that the risk of rebleeding was significantly lower among those who received definitive treatment based on capsule endoscopy findings than among those with either negative or positive findings who received no intervention. This finding led the authors to highlight the use of complementary treatment procedures. Both of the major forms of IBD (ie, Crohn disease and ulcerative colitis) may involve the colon, but they may often be distinguished from each other on the basis of upper GI tract involvement. Proper diagnosis informs treatment decisions,  such as electing to pursue surgical rather than aggressive medical management for treatment-refractory individuals. Crohn disease affects the small bowel in most individuals; in 30% of patients, the disease is limited to the terminal ileum. The traditional approach to this diagnosis has involved esophagogastroduodenoscopy, ileocolonoscopy, and radiography; unlike capsule endoscopy, these studies are limited in their ability to assess the jejunum and the proximal ileum. Barium studies are not as sensitive for the detection of early lesions, and traditional endoscopy is limited to the distal and proximal bowel. 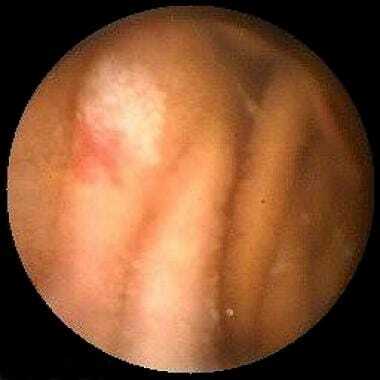 When used to evaluate IBD, capsule endoscopy allows visualization of lesions (eg, small-bowel erosions and ulcerations) in areas that other forms of endoscopy  or radiography [32, 33] would not visualize. 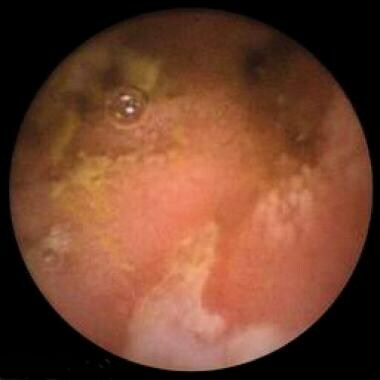 Capsule endoscopy can localize and define the extent and activity of IBD. A meta-analysis comparing the diagnostic yield of capsule endoscopy with that of other modalities (eg, barium studies, colonoscopy with ileoscopy, computed tomography [CT] enterography or enteroclysis, and small-bowel magnetic resonance imaging [MRI]) found capsule endoscopy to be superior in the diagnosis of a recurrence in nonstricturing small-bowel Crohn disease. For the initial diagnosis of persons with suspected Crohn disease, a trend toward improved yield was observed, although the difference was not statistically significant. A meta-analysis comparing the accuracy of capsule endoscopy, magnetic resonance enterography (MRE), and small-bowel intestinal contrast ultrasonography (SICUS) for detecting active small-bowel inflammation in patients with suspected or established Crohn disease found the three modalities to have similar diagnostic yields. Capsule endoscopy was superior to MRE with regard to detection of proximal small-bowel disease, though there was a risk of capsule retention to be considered. Small-bowel neoplasia occurs in 75% of patients with Peutz-Jeghers syndrome (PJS) and 90% of patients with familial adenomatous polyposis (FAP). In patients with FAP, therapeutic interventions in jejunal and ileal polyps remain undefined, perhaps because of the low incidence of nonduodenal small-bowel cancer. In patients with PJS, the risks of small-bowel cancer and obstruction are known, and screening may help avoid emergency surgery or cancer. Several of the patients in this study had previously undergone push enteroscopy with negative results. The improved diagnostic yield of a noninvasive method may facilitate early detection of small-bowel cancers, which, in turn, may affect outcome. Problems encountered included gaps in the recording (4% in this analysis) and short battery life (2.34%). Clinical limitations included the inability to swallow the capsule in 1.5% of patients and failure of the capsule to progress to the ileocecal valve during the recording interval in 14.97%, most often because of delayed gastric emptying. In two large reviews of capsule endoscopy performed for a variety of indications, [52, 15] the procedure was found to be safe and reliable for locating GI tract abnormalities, especially in the small bowel, an area where other imaging modalities were unsuccessful. The cost-effectiveness of capsule endoscopy and its impact on outcome remain to be definitively established. A follow-up study in France assessed 92 patients who underwent capsule endoscopy for a variety of indications and found that at 1 year, the positive and negative predictive values were 100% and 94%, respectively. The group concluded that capsule endoscopy may become the first diagnostic tool used after negative upper and lower endoscopy studies. In addition, with such a high negative predictive value, a negative capsule study should generally be sufficient to guide the work away from a search for small-bowel pathology. In obscure GI bleeding, push enteroscopy offers the capability of biopsy and endotherapy in those areas that it can image effectively. This relative benefit must be balanced against the finding that in patients with previously negative evaluations for GI bleeding, capsule endoscopy is more effective in finding abnormalities but does not offer immediate intervention. In irritable bowel disease, capsule endoscopy provides information about macroscopic lesions but does not allow histologic examination of the tissue. Capsule endoscopy provides more information than traditional barium studies but may carry a risk of capsule retention in patients with IBD and stricturing disease. Future studies are also likely to define the use of capsule endoscopy in children. Capsule endoscopy may also play a role in the evaluation of esophageal disorders (eg, Barrett esophagus), [57, 58] as an alternative to upper endoscopy for upper GI bleeding, and in the evaluation of portal hypertension and esophageal varices. Keroack MD, Peralta R, Abramson SD, Misdraji J. Case records of the Massachusetts General Hospital. Weekly clinicopathological exercises. Case 24-2004. A 48-year-old man with recurrent gastrointestinal bleeding. N Engl J Med. 2004 Jul 29. 351(5):488-95. [Medline]. Mow WS, Lo SK, Targan SR, Dubinsky MC, Treyzon L, Abreu-Martin MT, et al. Initial experience with wireless capsule enteroscopy in the diagnosis and management of inflammatory bowel disease. Clin Gastroenterol Hepatol. 2004 Jan. 2(1):31-40. [Medline]. Chen W, Yan G, He S, Ke Q, Wang Z, Liu H, et al. Wireless powered capsule endoscopy for colon diagnosis and treatment. Physiol Meas. 2013 Nov. 34(11):1545-61. [Medline]. Swain P. Wireless capsule endoscopy. Gut. 2003 Jun. 52 Suppl 4:iv48-50. [Medline]. Sidhu R, Sanders DS, McAlindon ME. Gastrointestinal capsule endoscopy: from tertiary centres to primary care. BMJ. 2006 Mar 4. 332(7540):528-31. [Medline]. Arnott ID, Lo SK. The clinical utility of wireless capsule endoscopy. Dig Dis Sci. 2004 Jun. 49(6):893-901. [Medline]. Iddan G, Meron G, Glukhovsky A, Swain P. Wireless capsule endoscopy. Nature. 2000 May 25. 405(6785):417. [Medline]. Shamsudhin N, Zverev VI, Keller H, Pane S, Egolf PW, Nelson BJ, et al. Magnetically guided capsule endoscopy. Med Phys. 2017 Aug. 44 (8):e91-e111. [Medline]. [Guideline] Pennazio M, Spada C, Eliakim R, et al. Small-bowel capsule endoscopy and device-assisted enteroscopy for diagnosis and treatment of small-bowel disorders: European Society of Gastrointestinal Endoscopy (ESGE) Clinical Guideline. Endoscopy. 2015 Apr. 47 (4):352-76. [Medline]. [Full Text]. [Guideline] Enns RA, Hookey L, Armstrong D, Bernstein CN, Heitman SJ, Teshima C, et al. 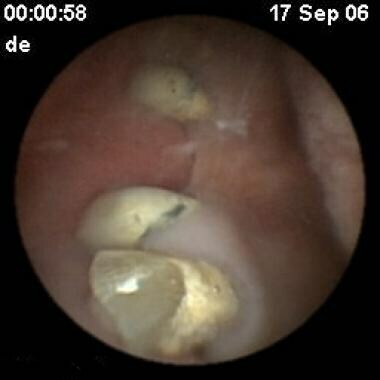 Clinical Practice Guidelines for the Use of Video Capsule Endoscopy. Gastroenterology. 2017 Feb. 152 (3):497-514. [Medline]. Liu K, Kaffes AJ. Review article: the diagnosis and investigation of obscure gastrointestinal bleeding. Aliment Pharmacol Ther. 2011 Aug. 34(4):416-23. [Medline]. Rockey DC. Occult gastrointestinal bleeding. N Engl J Med. 1999 Jul 1. 341(1):38-46. [Medline]. Scapa E, Jacob H, Lewkowicz S, Migdal M, Gat D, Gluckhovski A, et al. Initial experience of wireless-capsule endoscopy for evaluating occult gastrointestinal bleeding and suspected small bowel pathology. Am J Gastroenterol. 2002 Nov. 97(11):2776-9. [Medline]. Sturniolo GC, Di Leo V, Vettorato MG, De Boni M, Lamboglia F, De Bona M, et al. Small bowel exploration by wireless capsule endoscopy: results from 314 procedures. Am J Med. 2006 Apr. 119(4):341-7. [Medline]. Mylonaki M, Fritscher-Ravens A, Swain P. Wireless capsule endoscopy: a comparison with push enteroscopy in patients with gastroscopy and colonoscopy negative gastrointestinal bleeding. Gut. 2003 Aug. 52(8):1122-6. [Medline]. Mata A, Llach J, Bordas JM, Feu F, Pellisé M, Fernández-Esparrach G, et al. [Role of capsule endoscopy in patients with obscure digestive bleeding]. Gastroenterol Hepatol. 2003 Dec. 26(10):619-23. [Medline]. Adler DG, Knipschield M, Gostout C. A prospective comparison of capsule endoscopy and push enteroscopy in patients with GI bleeding of obscure origin. Gastrointest Endosc. 2004 Apr. 59(4):492-8. [Medline]. Ell C, Remke S, May A, Helou L, Henrich R, Mayer G. The first prospective controlled trial comparing wireless capsule endoscopy with push enteroscopy in chronic gastrointestinal bleeding. Endoscopy. 2002 Sep. 34(9):685-9. [Medline]. Leighton JA, Sharma VK, Hentz JG, Musil D, Malikowski MJ, McWane TL, et al. Capsule endoscopy versus push enteroscopy for evaluation of obscure gastrointestinal bleeding with 1-year outcomes. Dig Dis Sci. 2006 May. 51 (5):891-9. [Medline]. Hartmann D, Schmidt H, Bolz G. A prospective two-center study comparing wireless capsule endoscopy with intraoperative enteroscopy in patients with obscure GI bleeding. Gastrointest Endosc. 2005 Jun. 61(7):826-32. [Medline]. Delvaux M, Fassler I, Gay G. Clinical usefulness of the endoscopic video capsule as the initial intestinal investigation in patients with obscure digestive bleeding: validation of a diagnostic strategy based on the patient outcome after 12 months. Endoscopy. 2004 Dec. 36(12):1067-73. [Medline]. Min YW, Kim JS, Jeon SW, Jeen YT, Im JP, Cheung DY, et al. Long-term outcome of capsule endoscopy in obscure gastrointestinal bleeding: a nationwide analysis. Endoscopy. 2014 Jan. 46 (1):59-65. [Medline]. Neu B, Ell C, May A, Schmid E, Riemann JF, Hagenmüller F, et al. Capsule endoscopy versus standard tests in influencing management of obscure digestive bleeding: results from a German multicenter trial. Am J Gastroenterol. 2005 Aug. 100(8):1736-42. [Medline]. Kitiyakara T, Selby W. Non-small-bowel lesions detected by capsule endoscopy in patients with obscure GI bleeding. Gastrointest Endosc. 2005 Aug. 62(2):234-8. [Medline]. Viazis N, Papaxoinis K, Theodoropoulos I, Sgouros S, Vlachogiannakos J, Pipis P, et al. Impact of capsule endoscopy in obscure small-bowel bleeding: defining strict diagnostic criteria for a favorable outcome. Gastrointest Endosc. 2005 Nov. 62(5):717-22. [Medline]. Appleyard M, Walsh A. Capsule endoscopy for obscure GI bleeding: A report of 100 consecutive cases to investigate long term outcomes (Abstract). The 5th International Conference on Capsule Endoscopy Program and Abstracts. 2006. 42. Maldonado H, Arment A. Capsule endoscopy has a long term impact over recurrent bleeding in patients with obscure GI bleeding (Abstract). The 5th International Conference on Capsule Endoscopy Program and Abstracts. 2006. 60. Tziatzios G, Gkolfakis P, Dimitriadis GD, Triantafyllou K. Long-term effects of video capsule endoscopy in the management of obscure gastrointestinal bleeding. Ann Transl Med. 2017 May. 5 (9):196. [Medline]. [Full Text]. Long MD, Barnes E, Isaacs K, Morgan D, Herfarth HH. Impact of capsule endoscopy on management of inflammatory bowel disease: A single tertiary care center experience. Inflamm Bowel Dis. 2011 Sep. 17(9):1855-62. [Medline]. Triester SL, Leighton JA, Leontiadis GI, Gurudu SR, Fleischer DE, Hara AK, et al. A meta-analysis of the yield of capsule endoscopy compared to other diagnostic modalities in patients with non-stricturing small bowel Crohn's disease. Am J Gastroenterol. 2006 May. 101(5):954-64. [Medline]. Buchman AL, Miller FH, Wallin A, Chowdhry AA, Ahn C. Videocapsule endoscopy versus barium contrast studies for the diagnosis of Crohn's disease recurrence involving the small intestine. Am J Gastroenterol. 2004 Nov. 99(11):2171-7. [Medline]. Galter S. Usefulness of the capsule endoscopy in the study of inflammatory bowel disease: preliminary results (Abstract). ICCE: The International Conference on Capsule Endoscopy, Europe. 2006. 17. Girelli CM, Porta P, Malacrida V, Barzaghi F, Rocca F. Clinical outcome of patients examined by capsule endoscopy for suspected small bowel Crohn's disease. Dig Liver Dis. 2007 Feb. 39 (2):148-54. [Medline]. Fireman Z, Mahajna E, Broide E, Shapiro M, Fich L, Sternberg A, et al. Diagnosing small bowel Crohn's disease with wireless capsule endoscopy. Gut. 2003 Mar. 52(3):390-2. [Medline]. Efthymiou A, Viazis N, Vlachogiannakos J, Georgiadis D, Kalogeropoulos I, Mantzaris G, et al. Wireless capsule endoscopy versus enteroclysis in the diagnosis of small-bowel Crohn's disease. Eur J Gastroenterol Hepatol. 2009 Aug. 21 (8):866-71. [Medline]. Herrerías JM, Caunedo A, Rodríguez-Téllez M, Pellicer F, Herrerías JM Jr. Capsule endoscopy in patients with suspected Crohn's disease and negative endoscopy. Endoscopy. 2003 Jul. 35(7):564-8. [Medline]. Kopylov U, Yung DE, Engel T, Vijayan S, Har-Noy O, Katz L, et al. Diagnostic yield of capsule endoscopy versus magnetic resonance enterography and small bowel contrast ultrasound in the evaluation of small bowel Crohn's disease: Systematic review and meta-analysis. Dig Liver Dis. 2017 Aug. 49 (8):854-863. [Medline]. Burke CA, Santisi J, Church J, Levinthal G. The utility of capsule endoscopy small bowel surveillance in patients with polyposis. Am J Gastroenterol. 2005 Jul. 100(7):1498-502. [Medline]. Mata A, Llach J, Castells A, Rovira JM, Pellise M, Gines A, et al. A prospective trial comparing wireless capsule endoscopy and barium contrast series for small-bowel surveillance in hereditary GI polyposis syndromes. Gastrointest Endosc. 2005 May. 61(6):721-5. [Medline]. 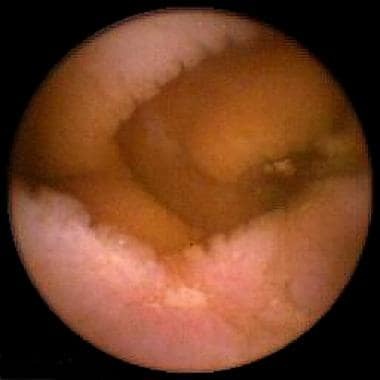 Mozer M. Capsule endoscopy findings in 20 consecutive patients with Peutz-Jeghers syndrome (Abstract). ICCE: The International Conference on Capsule Endoscopy, Europe. 2006. 117. Toth E. Clinical evaluation of capsule endoscopy in diagnosing small bowel tumors (Abstract). ICCE: The International Conference on Capsule Endoscopy, Europe. 2006. 109. Rondonotti E, Herrerias JM, Pennazio M, Caunedo A, Mascarenhas-Saraiva M, de Franchis R, et al. Complications, limitations, and failures of capsule endoscopy: a review of 733 cases. Gastrointest Endosc. 2005 Nov. 62(5):712-6; quiz 752, 754. [Medline]. De Vitis I. Association of duodenoscopy and capsule endoscopy to staging coeliac disease: preliminary study in Italian population (Abstract). ICCE: The International Conference on Capsule Endoscopy, Europe. 2006. 13. Leighton JA, Sharma VK, Hentz JG, Musil D, Malikowski MJ, McWane TL, et al. Capsule endoscopy versus push enteroscopy for evaluation of obscure gastrointestinal bleeding with 1-year outcomes. Dig Dis Sci. 2006 May. 51(5):891-9. [Medline]. Aabakken L, Scholz T, Østensen AB, Emblem R, Jermstad T. Capsule endoscopy is feasible in small children. Endoscopy. 2003 Sep. 35(9):798. [Medline]. [Guideline] Argüelles-Arias F, Donat E, Fernández-Urien I, Alberca F, Argüelles-Martín F, Martínez MJ, et al. Guideline for wireless capsule endoscopy in children and adolescents: A consensus document by the SEGHNP (Spanish Society for Pediatric Gastroenterology, Hepatology, and Nutrition) and the SEPD (Spanish Society for Digestive Diseases). Rev Esp Enferm Dig. 2015 Dec. 107 (12):714-31. [Medline]. Urgesi R, Cianci R, Pagliari D, Newton EE, Rizzo G, Costamagna G, et al. Is capsule endoscopy appropriate for elderly patients? The influence of ageing on findings and diagnostic yield: An Italian retrospective study. Dig Liver Dis. 2015 Sep 28. [Medline]. Carlo JT, DeMarco D, Smith BA, Livingston S, Wiser K, Kuhn JA, et al. The utility of capsule endoscopy and its role for diagnosing pathology in the gastrointestinal tract. Am J Surg. 2005 Dec. 190(6):886-90. [Medline]. Dhalluin P. Clinical impact at the patient investigated by capsule endoscopy pillcam sb:1-year follow-up French study (Abstract). ICCE: The International Conference on Capsule Endoscopy, Europe. 2006. 51. Nakamura T. The first multicenter study of capsule endoscopy in Japan (Abstract). ICCE: The International Conference on Capsule Endoscopy, Europe. 2006. 65. Marmo R, Rondonotti E. Cost effectiveness of capsule endoscopy in patients with obscure GI bleeding (Abstract). The 5th International Conference on Capsule Endoscopy Program and Abstracts. 2006. 62. De Leusse A. Efficiency of capsule endoscopy and push enteroscopy as first line exploration of obscure GI bleeding. Final results of a randomized controlled trial (Abstract). ICCE: The International Conference on Capsule Endoscopy, Europe. 2006. 73. Plum N. Prospective evaluation of the esophageal capsule endoscopy for the detection of Barrett's Esophagus and Early Barrett's Cancer (Abstract). ICCE: The International Conference on Capsule Endoscopy, Europe. 2006. 123. Chavalitdhamrong D, Chen GC, Roth BE, Goltzer O, Sul J, Jutabha R. Esophageal capsule endoscopy for evaluation of patients with chronic gastroesophageal reflux symptoms: findings and its image quality. Dis Esophagus. 2011 Jul. 24 (5):295-8. [Medline]. Liangpunsakul S, Chadalawada V, Rex DK, Maglinte D, Lappas J. Wireless capsule endoscopy detects small bowel ulcers in patients with normal results from state of the art enteroclysis. Am J Gastroenterol. 2003 Jun. 98(6):1295-8. [Medline]. Marmo R, Rotondano G, Piscopo R, Bianco MA, Cipolletta L. Meta-analysis: capsule enteroscopy vs. conventional modalities in diagnosis of small bowel diseases. Aliment Pharmacol Ther. 2005 Oct 1. 22(7):595-604. [Medline]. Bruin KF. Video capsule endoscopy in children (Abstract). ICCE: The International Conference on Capsule Endoscopy, Europe. 2006. 171. Nemeth A, Wurm Johansson G, Nielsen J, Thorlacius H, Toth E. Capsule retention related to small bowel capsule endoscopy: a large European single-center 10-year clinical experience. United European Gastroenterol J. 2017 Aug. 5 (5):677-686. [Medline]. [Full Text]. Barkin JS, O'Loughlin C. Capsule endoscopy contraindications: complications and how to avoid their occurrence. Gastrointest Endosc Clin N Am. 2004 Jan. 14(1):61-5. [Medline]. Spada C, Riccioni ME, Costamagna G. Patients with known small bowel stricture or with symptoms of small bowel obstruction secondary to Crohn's disease should not perform video capsule endoscopy without being previously tested for small bowel patency. Am J Gastroenterol. 2007 Jul. 102(7):1542-3; author reply 1543-4. [Medline]. Nemeth A, Kopylov U, Koulaouzidis A, Wurm Johansson G, Thorlacius H, Amre D, et al. Use of patency capsule in patients with established Crohn's disease. Endoscopy. 2016 Apr. 48 (4):373-9. [Medline]. Video of capsule endoscopy from patient with gastrointestinal bleeding.